If I seem a little lethargic and worn out today, there is a valid reason. 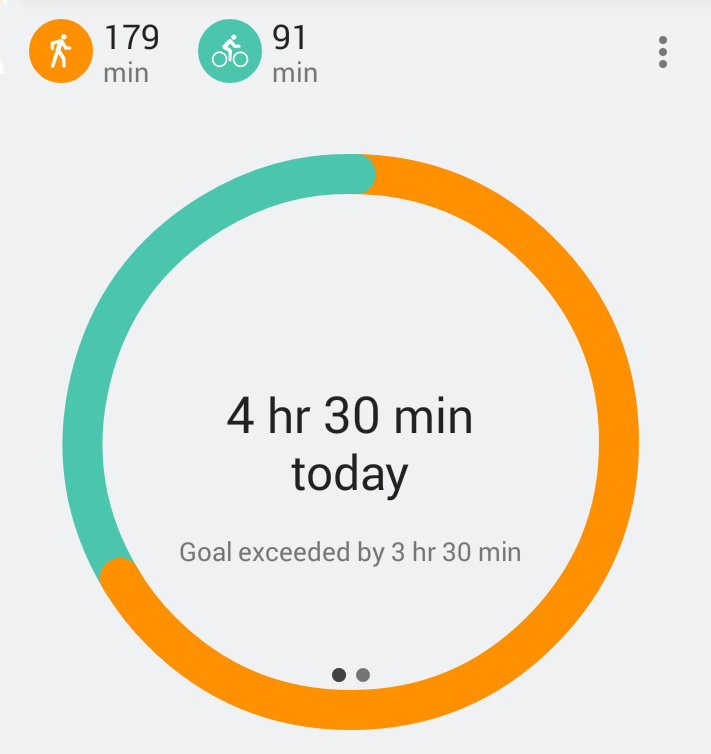 The picture to your left is a screenshot of the Google Fit app running on my phone yesterday. As you can see I vastly exceeded my daily goals. I had plans to meet some geocacher friends in Greensboro at 6:15PM to do a night cache. Since Greensboro is over 100 miles away, I decided to make a day of it by geocaching along the way towards Greensboro. I looked at the maps and saw two trails that looked like fun along that route. 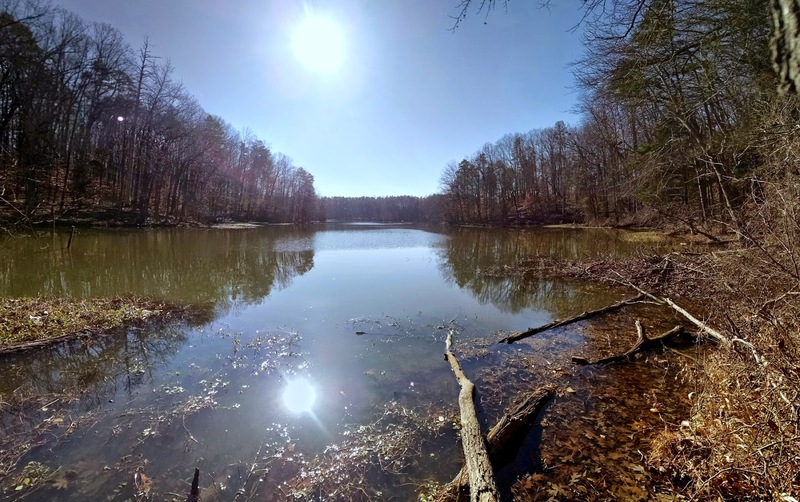 One was a 2.2 mile (one-way) trail that wound thru some of the hills of the piedmont called the Girl Scouts, Hornets' Nest Council Trail, just east of Statesville. The other is a series of trails at the Piedmont Environmental Center in High Point. Either trail could qualify as a good days geocaching adventure in and of themselves. To make things a little more daunting, I also needed to save some endurance for the night cache, which promised more hiking. So as any rational human being would do, I decided to do it all. I figured I could bike the first trail using the Geobike Of Destiny, and hike the second trail on foot. My logic being that the thing that gets the most tired after a day of hiking is the bottom of my feet (being a fat guy has disadvantages in this area), and biking the first half would keep me off my feet, thereby giving me more endurance. I was not proven entirely wrong. So I started my day just before sunrise, piled my gear into the Geovan Of Destiny, and started down the road. 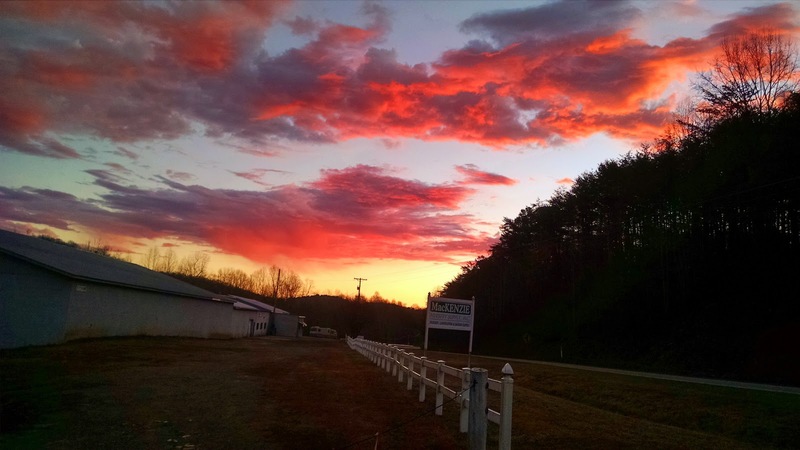 At which time I was greeted with this rather stunningly nice sunrise, which seemed like a good omen. When I got parked up at the first trailhead, I pulled out my bike and headed down the trails. There were 17 geocaches along the route. A geocaching couple I know hiked this trail the day before, and DNFd 3 caches, which I didn't bother trying to find. One other was a puzzle cache I did not get the chance to solve. As a result I found 13 caches along the trail. Along the line my GPSr hit its own milestone: 1000 cache finds using this device. The first 2/3rds of a mile along the trail has a lot of hills, and windy bits with steep drop-offs on one side. I am not a super-awesome trail rider so this setup made me nervous, but I pressed on. The remaining part of the trail was thankfully mostly flat-ish, so the going was easier. By the time I hit the hilly/windy bits of the trail on the way back I had gotten much more comfortable on the bike, and managed to make the return trip quickly and easily. The ride successfully completed, I then drove an hour over to the Piedmont Environmental Center to start the hiking portion of the day. The second physical cache I found there had this jaunty smiley face ball in it, which also seemed like a good omen. Good omens are fickle beasts tho, as somewhere along the way I slightly sprained my foot by stepping on a root incorrectly while DNFing a cache, I ended up DNFing 3 caches, but found 7, so it worked out quite well. When I was one with the trails it was almost 2:30PM. Some of my friends had hit town early so we all met up to eat a late lunch, then did some park and grabs until it was time to do that night cache. The lunch break and a couple hours of easy caches allowed me to rest up enough to tackle that night cache. So all in all my theory of biking and hiking to extend my endurance mostly worked. While biking and hiking use different muscles in my legs, and the fact that biking keeps weight off my feet, definitely extended my range. However my legs are now recovering from both a grueling trail ride, and a decently challenging hike, all at the same time. So please forgive me if I don't get off the couch for the rest of the day. Actually, according to the Google Fit app, I don't have to exercise again for the rest of the year - so I have that going for me - however tomorrow I will be bike commuting to work, so I better make the best of this day of rest to recover from what was a wonderful, albeit exhausting, day of geocaching.